The Liberian Football Association should have done more to prevent the trafficking of 23 youngsters to Laos, according to its president. 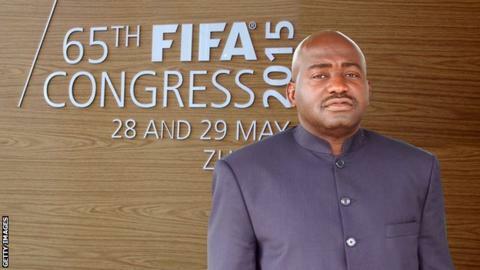 LFA President Musa Bility said: "Whatever role we might have played, I believe it is regrettable." "Maybe we should have done more than we did," Bility told BBC Sport. "At our level, we probably need to have an investigation as to why they didn't do that." The BBC was alerted to the situation by by world players' union FIFPro, who had been investigating the case for four months and said it suspects the trafficking "is not one of its kind, but probably the tip of the iceberg". Bility - who intends to run for the Fifa presidency - wants the remaining children to return home. "We have to bring them home," he insisted. "Not only that, we asked the foreign ministry a month ago to ask the Laos government to intervene. They have to come home. "I went to the foreign minister myself. They have diplomatic protocols and they are going to make the necessary representation." However BBC Sport understands some of the boys do not want to come home despite a lack of work permits and very little freedom. "That is a sad story, a truly sad story," he said. "We should, as a country, be able to provide opportunity. Those opportunities are not here. Liberia is over 165 years old and we are just completing the first football training centre. "Maybe if that training centre was here, those kids would not be in Laos." He also defended the LFA's role in allowing the players to move to Laos. "I think the organisation that sent for these people misinformed the LFA - that is a serious crime," he said. "They should have no place in football. I hope that Fifa will look into this - we hope something will happen. "Because as it is, this is almost tantamount to child trafficking. "This organisation must be banned - otherwise you might have worst cases than this because these kids could be lost."